Who inspires me: Everyday people “being the change they want to see” is what inspires me. Best advice Take the courage to say “no” to some things because of the greater “yes” burning within you. Australian woman Penny Elsley was picking her way along a drain in an Indian slum, stench assaulting her nostrils, filth at her feet, when she witnessed the sight of pure happiness. Hearing the sound of women calling cries of welcome, she raised her gaze to see a group of women poking their heads out of cardboard box homes with great smiles spread across their faces. Penny found the sight of these joyful women so at odds with their depressing surrounds that their image stayed with her. The looks of pure joy on their faces became etched in her mind as she talked to her friends at home. The sight of their happiness sparked something deep inside her – a question she knew she had to explore. How could it be, she pondered, that these women with no material possessions, living in squalor, seemed far happier than her and her privileged friends in Sydney, Australia? How could it be … that these women with no material possessions, living in squalor, seemed far happier than her and her privileged friends in Sydney, Australia? 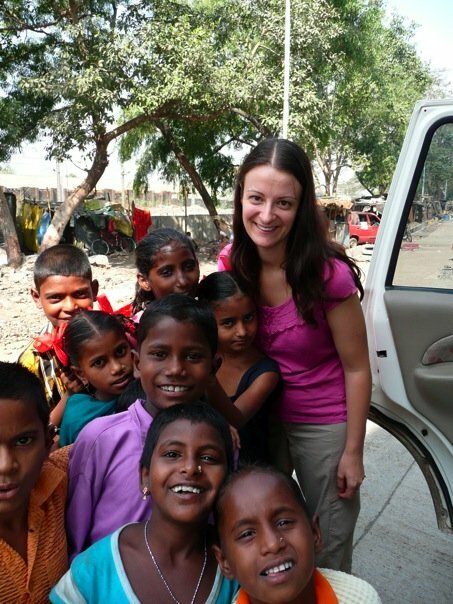 Penny in Munbai, India, with children from the School on Wheels. Fast forward 10 years and a door bell sounds in the middle class suburb of Dianella in Perth, Western Australia. An Italian woman bustles to the door and gushes a welcome to the stranger before her. Soon another stranger arrives, and another. It’s not long before a group of new and long-term Australians are seated around the dinner table – people who’ve never before met are now bonding over food. 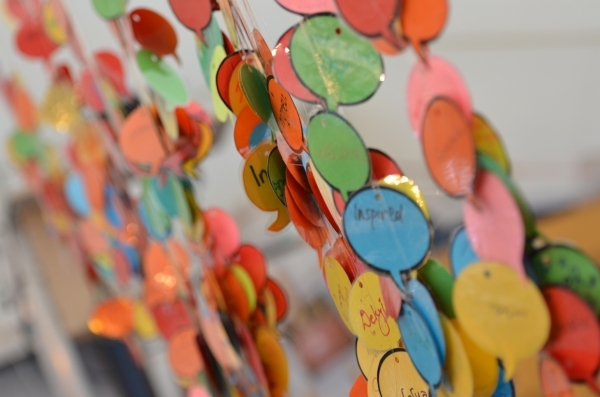 These strangers have come together as part of Penny’s Welcome Dinner Project, where trained facilitators create a safe space for people seeking to meet one another in a supported way. 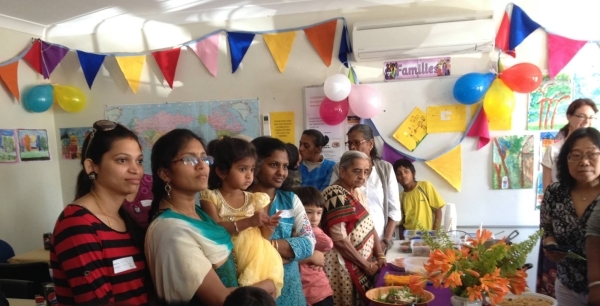 Welcome Dinners are now being staged in local homes across the country as a way of bringing together groups of strangers – refugees, asylum seekers, migrants, international students and Australians – around the kitchen table to share a pot-luck meal and conversation. The results of this simple act of sharing and connection are changing lives, as once-isolated people begin to connect with their communities, sparking new friendships and changing perceptions. Such is the success of the Welcome Dinner Project that it is now attracting high-profile attention. The program featured on Channel 10’s TV show “The Project”, where celebrity Matt Preston from Masterchef joined the dinner. Several crowd-funding campaigns to keep the venture going have raised more than $60,000. What’s the secret to the dinners’ success? The answer is easy, says Penny. “Connection” – the very thing that the joyful Indian slum dwellers had over many Westerners. The results of this simple act of sharing and connection are changing lives. A bigger scale Welcome Dinner. Having never before seen a white person, the children were terrified by the sight of her skin, of her clothes, her sunglasses, pretty much everything about her. Though their shock quickly turned to curiosity and excitement, Penny later discovered that these children were in fact starving, their food supply cut off for months due to drought. How could it be, she thought, that in an increasingly ‘connected’ world, some communities were becoming ever-more disconnected? Again the notion of connection, or disconnection, stood out. How could it be … that in an increasingly ‘connected’ world, some communities were becoming ever-more disconnected? His answer sparked something deep inside Penny. She embarked on furious journaling sessions to elicit an answer. Visions swirled before her – the connected Indian woman and their smiles, the isolated children in Kenya, her friends too distracted by technology and chronic busyness to connect with the people around them. He was right. Joining the dots was the answer. Human connection was the antidote to misery. And she’d do whatever she could to help others spark the connection missing from so many lives. Human connection was the antidote to misery. Working on a program with refugees, Penny found herself chatting to group of Sudanese women. One woman lamented the fact that, despite five years of living in Australia, she’d never been invited into an Australian home. Another woman close by spoke up. For her it had been 10 years without such an invite. Participants at the Welcome Dinners complete speech bubbles sharing their thoughts on the dinners. 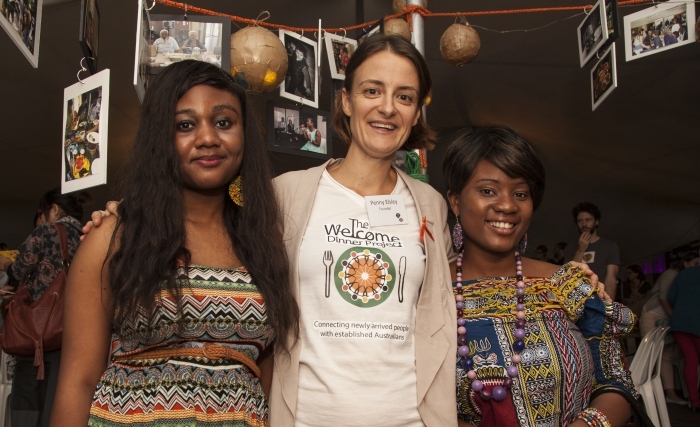 Since that dinner the Welcome Dinner Project has ignited across the country. 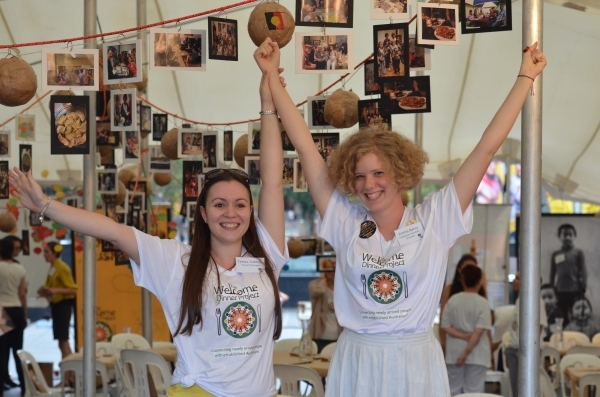 More than 100 Welcome Dinners and lunches have now taken place in capital cities Australia wide, including several large-scale dinners, such as at the Open Marrickville Festival in Sydney where 250 newly arrived and established Aussies turned up with their dish in hand. More than 200 volunteers have completed the Welcome Dinner facilitator training, giving further evidence to the rising of this grass-roots movement. Guests are requested not to ask others about how the came to be in Australia or where they work. Instead they discuss the food they’ve brought with them, their hobbies, their experiences of living in Australia and what they are passionate about. More than 200 volunteers have completed Welcome Dinner facilitator training. One Welcome Dinner participant had been living in immigration detention with other people from his homeland. He’d been in the country 18 months and hadn’t talked to an Australian. He attended a Welcome Dinner picnic where he revealed he’d been a photographer in his homeland. He started taking some photos of the picnic with a borrowed camera. He found his confidence. He became involved photographing other dinners. “Now he has so many friends I have to book a time to see him,” Penny laughs. Or there’s the women who started exercising together, those who joined a community garden, those who invited their new friends to barbecues. The Welcome Dinners are a launching pad for new friendships, they spark a night of connection that can ignite all sorts of positive change. The Welcome Dinners are a launching pad for new friendships, they spark a night of connection that can ignite all sorts of positive change. The Welcome Dinner Project encourages anyone who is new to Australia in the past 10 years to sign up to attend a dinner via: www.joiningthedots.org. Anyone can volunteer to host Welcome Dinners in their home or become a Welcome Dinner facilitator. Find out more at www.joiningthedots.org. Wow, just wow! Just had totally made me want to go out and make a difference in the world. Hey Beth. Thanks for the comment – that’s exactly the reaction I’m hoping for! That’s how people like Penny make me feel too. They are amazing.